Add rich warmth and comfort to any night's sleep with the outstanding gusset featherbed by Hotel Grand. 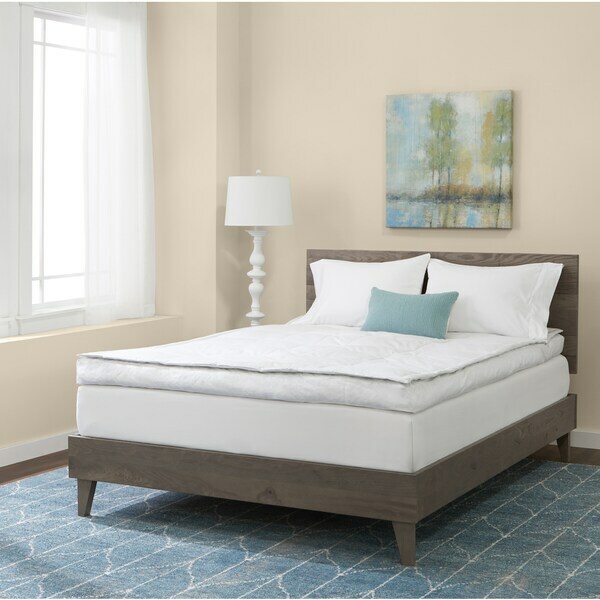 This luxurious featherbed features a plush five-inch top brimming with 500 fill power white down and feather fill. The lightweight shell is made from 100-percent with a 233 thread count and baffle-box construction that keeps fill neatly in place over time. Down and feather-filled products are packaged tightly duringshipping. Upon receipt, remove this item from its packaging, fluffgently, and allow several hours for full loft recovery. Inaddition, products sealed in plastic packaging sometimes have adisagreeable scent because of concentrated natural fibers. A fewhours of airing typically removes the odor. Junk Item, will fall apart in 6 months, don't buy! After reading such high reviews, I bought this featherbed. IT is so awful, I have taken it off my bed after only 3 months of use. Feathers float everywhere and stick you all the time. My husband and I were never comfortable sleeping on this featherbed. Save your money. I purchased this in May...now it is November and it is in the garbage already. It was wonderful when I first purchased it. Slowly over the months it started loosing feathers. They started to poking through and they are really sharp. It also took me forever to get the feathers from the underside of the featherbed out of my mattress. They were in there pretty good. I have a feeling I will be finding feathers for a long time. I guess I got the only reject. I bought this for my son in May, put it on his bed, I got no comments from him at all. Finally 3 weeks go by and he finally tells me the feather bed is flat and has been since he first slept on it. I have bought other feather beds from O and they all have been great, now its to late to return it, and I am out the price of a flat featherbed.. How did this happen? It makes me bed feel like I am in a luxury hotel. Love it! Will purchase for my guest room as well. Bought for my son whose mattress was making him "achey". He said it's comfortable and not too hot. It is natural down so you can feel the feathers. Not smooth. I'm going to get him a mattress cover to smooth it out. The thickness doesn't seem like 5" to me. Great Product with the perfect fluff! This featherbed is wonderful! Extremely comfortable. The gussets help keep the feathers in place. The 5" thickness is unbeatable, and the downtop makes it so cozy! It also keeps the feathers from coming through. I own 2 of these! So cozy and comfy. Best purchase! No odor whatsoever! Not sure it is thick enough though. My mattress is super firm and this offers minimal relief. I love this feather bed!! It was sized just right, I purchased a queen There is a section on the bottom of feathers and a top section of down. I purchased a cover for it and I have not had any feather escape. I also purchased a set of sheets that are extra deep to accommodate the room for the "bed". I remove and wash sheets once a week; and shake and rotate (not turn over) the feather bed (180) each time. "will this work on adjustable bed ?" I would imagine it would. I can’t see a reason why it would not. It’s a great featherbed. I do advise getting a featherbed cover for any featherbed though. It keeps it clean and any possible feather poke through. "It says white down and feathers, are those white good down and white goose feathers? And what’s percentages of each?" "I notice in the older reviews there are a lot of complaints of poking and escape feathers. As I read more recent reviews like a ten year later reviews, It seems that people don't have that problem anymore. Was there a documented manufacturer change in the design or making of these featherbeds that accounts for the noticeable quality improvement?" I haven't noticed any poking of feathers but, the feathers do escape. It's not a significant amount but, you will notice feathers on the floor when you change your sheets. You definitely have to fluff it on a weekly basis as it flattens and shifts to wherever no one is sleeping. I purchased it to go over my hard mattress which it did help with but, I have to say that it's just OK. I can't say that I feel like I'm sleeping on a cloud which is what I was hoping for. Hope this helps. I always use a mattress topper to put over the feather top. My last one lasted 20 years. No sign of wear yet , on this one. About two years of daily use. "do you put sheets on top of this topper"
Yes. And every time I change my sheets I pouf the featherbed and rotate it. Keeps it fluffy and cozy. I love sleeping on this featherbed. I got it originally to help with a sleeping disorder and it has helped. "Is there a warranty with this bed? I have read the reviews some good & others awful, i can't afford to make a mistake in this investment?" I don't know if my first response went through. May have lost it. I purchased a full size for a guest room. My guest was allergic to down and I put it on my King. I'm using it for several months. I once had a topper that was down, store closed, so I had to use it for 8 years. It was a "10" This one I would rate as a 7. It does not smell as some do. A USA brand features one Dept. store, featuring it as 'cleaned three times - doesn't smell.' The smell in the store was terrible. This one hold true. It's a 5-inch gusset. It's nice the edging is fluffy. The center is not as thick. Could be a defect? But after searching for the comfort of my original one I am keeping this for the guest room. I need to get the kind either in this model or I will ask customer service a few questions about the other down baffle they sell. I will also consider an alternate of micro-fiber. I checked the terms on this product. Mattresses can be returned only if rejected due to defective problems discerned at delivery. New and not used. Dept, Stores will allow you to sleep on a pillow or topper for a couple of days and return it if not pleased, You need to call customer service. Tell them you only want to open it and let it air out and touch it, lie on it one time to see if it's comfortable. I believe they would allow that. If not I wouldn't buy it. It's hard to get these in stores since only the micro-fiber are sold these days. I want to know why the center of this product is about 2-inch when fluffed up and the sides get the full treatment of 5- inch thick. This would be a "10", 5-stars if the center was as comfortable as the edges. The only con: When fluffed dust will fly unseen but will gather on the floor. Some feathers as well. My good one I once owned lost a few feathers when new but I didn't have a dust problem. I'm not allergic but now I take a pill. Two new down pillows is causing it. I prefer to sleep without pain, get up well rested without pain, and hope the allergy will go away as the pillow or topper settle in. Don't miss the opportunity - it works. But do negotiate a way to touch, smell, and briefly lie down. You'll know at once if it's for you. As it is I would not part with this product unless I can get a king. If the King is less thick I will need to return it and get the 5-in gusset. If this full is the only product, I don't care if it doesn't fit the bed. I'm getting great sleep from it. If I am not tired I sleep at the edges, then when I begin to get sleepy I position myself and stay in the middle. I don't get annoyed too much at some imperfections of may products as long as it works and accomplishes its objective. This one does the important thing: Stress, pain, are so diminished by this featherbed; it's hard to dismiss it. "if the size of my mattress will be a twin XL, will a twin size fit?" "I need this in a queen.. Any idea when you will have them in stock?"